Davy Crockett, King of the Wild Frontier and Disney Icon, had it right. Some days you get the bear and some days the bear gets you. Fact is, today Hannah and I are in Davy Crockett country in eastern Tennessee to hike the Cumberland Trail when the bear gets us. I’ll explain, but first. Click here to listen to the Ballad of Davy Crockett from the 1955 Disney TV mini-series and take yourself back to the coonskin cap craze of the Fifties. Having come to the South this first week of October, we plan to hike the waterfall trails of Tennessee and Georgia as well as the Appalachian Trail in the Great Smoky Mountains National Park. This Sunday we have landed in Dayton, Tennessee. Back in the day, Dayton was quite the center of controversy. Nearly a century later, we see that “America” has come to the rural South. In the two bustling little towns we have visited (i.e., Dalton, GA yesterday and Dayton today), there are Comfort Inns and Marriotts with Red Lobsters and Applebees on the edge of town. There are Lowes and Wal-marts and all the Taco Bells, Mickey Dees, and Little Caesar’s Pizzas you could want. Dalton has an “Historic Downtown” (i.e., tired buildings with empty store fronts here and there). Nearby Bryan College was founded in the aftermath of the Scopes Trial to establish an institution of higher education to teach from a Christian worldview. Traveling from our Sleep Inn and Suites on route 27 in Dalton, we have a simple four miles of driving to the Laurel Snow State Natural Area heading into the mountains. Then we hit the ¾ mile gravel and dirt road to the trailhead parking. Weaving in and out to avoid the potholes and gullies, we muddle along at 10 mph, wondering if we will be the only ones on the trail. Thankfully we arrive at the trailhead with 12 other cars. I relax and am more confident that we won’t be heading into some sort of Deliverance wilderness. As a Yankee, I have a hard time getting the depravity of the Burt Reynolds film, Deliverance (1972) and my stint in the Knoxville, TN jail (1971) out of mind when I am in the rural South. Click here for Part 1 of Dan’s Weekend Incarceration in the Knoxville Jail. Planning to hike to the 80’ foot Laurel Falls, we see a sign at the trailhead that says that the Laurel Creek Bridge is out. But that can’t be the bridge to Laurel Falls; there are so many other hikers on the trail today. In this one-time coal mining area, we hike on a 6’ wide trail above the stony and boulder-y Laurel Creek that has not a bit of flowing water. That is not a good sign for our chances of seeing a waterfall of any size this afternoon. Still, we remain upbeat and feel hopeful that we will see some sort of tumbling waters, Tennessee-style. Meeting a woman older than our 68 years, toting a 40-pound pack, we chit chat. When we say we are from Maine to see a waterfall, she says, Oh that’s too bad, you came all this way. This is another bright red flag that there is little we can do about and so we hike on. Promised a mile and a half of hiking along the river, we follow the white blazes (i.e., white vertical rectangles painted on trees denoting the main trail) of the Cumberland Trail. These white blazes will prove to be our godsend. Soon we are rock scrambling along the river with no sense of a trail. Without a white blaze in sight, we wise up, back track, and finally notice a fallen tree where we missed the sign that says “Main trail;” and then we see a white blaze just ahead. Hiking up the mountainside, we have a trail that narrows with many sharp rocks and roots along the way. In the distance we see a metal bridge across the river. As we approach, we see it has been mangled and understand why it has been closed. But then across the river, we see a couple and figure if they can cross this bridge, so can we. Nimbly, we step up and over the twisted bridge and cross easily. On to Laurel Falls, we now have a trail which is a combo rock scrambling/foot path. Again we come to what seems to be a dead end, having lost the white blazes. Looping back after a few minutes, we find that there is a tunnel through the rocks where we are supposed to go. 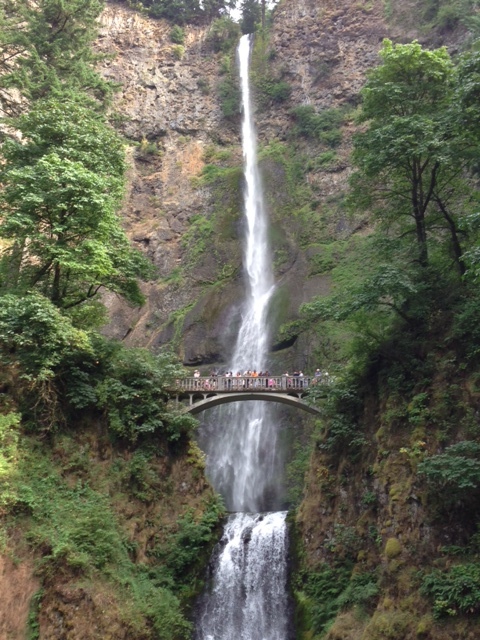 …there is not even a trickle of water coming down from what is usually an 80’ falls. Such is life and thank you Davy, for adding some much needed perspective: Some days you get the bear and some days the bear gets you. On August 28, 1963 Martin Luther King, Jr. delivered these momentous words in what is now known as the I Have a Dream speech. Click here to see MLK give this speech. As a Jersey boy, I never really knew of the location of Stone Mountain or Lookout Mountain. Fact is, I wasn’t curious enough to even find out, and for that I am not proud. While Stone Mountain is just to the east of Atlanta, it turns out that Lookout Mountain is on the Tennessee/Georgia border just to the southwest of Chattanooga, TN. Today we have come to King’s Lookout Mountain to hike. More than two months ago, Delta Airlines moved up our Saturday morning flight from Boston to Atlanta from 825A to 715A. You might be thinking, Dan, my boy, what’s the big deal! It’s just an hour and change. True, it doesn’t seem like much, but it does mean that Hannah and I must awake at 245A for the drive from our home in York, Maine to Logan Airport in Boston 60 miles to our south. At this point the universe sweetly steps in – we now have a golden opportunity to hike in Tennessee this afternoon. Travel Tip #1 – Fly early Saturday morning when you can. In addition to avoiding the weekday commuter traffic getting to the airport, you will have a full afternoon to enjoy yourself wherever you land. Escaping the noontime Atlanta city traffic on this first Saturday in October, we drive north on I-75 for nearly 100 miles to our overnight stay at a Comfort Inn and Suites in Dalton, Georgia. After a quick change to shorts and tee-shirts on this mid-70s day, we drive further north to the Tennessee border for Lookout Mountain. Driving first up the mountain on the Scenic Highway, then turning onto West Brow Road, we see cars here, there, and everywhere. Quarter-eating parking meters line the streets. Finally finding a parking spot near the Lookout Mountain Battlefield Visitor Center where the trails begin, we find we have nary a quarter between us. While Hannah stays with our rental Hyundai Elantra to protect and defend our parking space, I go in search of two bits. Travel Tip #2 – Save your quarters at Lookout Mountain. I learn from a local proprietor that 75% of the parking meters are broken and no one checks them anyway. He smiles and says, Enjoy your afternoon in the park. With total confidence in the young man, we put on our hiking boots, I my Cabela hiking hat, and head to the ranger station. Our trust is later rewarded as we have no parking ticket upon our return. Travel Tip #3 – Talk to the park ranger before hiking. Though I researched the hikes at Lookout Mountain online, I never got the excellent local knowledge or detailed map of the trails that I did from the ranger here on site. Lookout Mountain was the site of an important Union victory over the Confederacy in November of 1863. (By the way, on the 19th of that month A. Lincoln delivered his 272-word Gettysburg Address.) This success lifted the siege of Union forces trapped in Chattanooga and opened the South to eventual Union victory. Click here for the full story of this battle. Travel Tip #4 – If 62 or older and dig our national parks, be ye a hiker or not, get a lifetime Senior Pass for a sawbuck ($10) for admission to every national park, monument, or battlefield. Walking through the battlefield park, we see the expansive views to Chattanooga and the meandering, oxbow Tennessee River. On this sunny weekend Saturday, the park is happy with people but in no way mobbed. Descending a lengthy set of metal stairs, we plan for two hours of hiking on our way to Sunset Rock and beyond. The trails have just enough people so we can ask the occasional fellow hiker to take a trail picture of us. (By the way, we never say Cheese. Rich, a wedding photographer/former classmate of mine at Arizona State, has his couples say Money.) In return, Hannah always asks if the other couple would like one of themselves. Most couples are surprised, then pleased, and finally say, looking at each other, why not? With the trails of Lookout Mountain on the opposite side of the views of Chattanooga itself, we hug the mountainside just below the stone walls above us and the steep drop-offs beside us. Very rocky on this lush Tennessee hillside, the trail is just wide enough for one, but it never seems perilous with the rich vegetation to our right as a buffer. Soon we come upon twenty-somethings with ropes, carbineers, and courage, climbing the mountainside. Belayed and tethered to the hooks in the rock, one young woman in the picture to the right is carrying on a conversation as she works her way up the vertical cliff. Clearly this is not her first rodeo. With access to 30 miles of bluff trails here on Lookout Mountain, we have a final stone stairstep climb to our destination at Sunset Rock. And what do you know, there we see the same young woman near the summit. Standing in awe of her nimbleness, confidence, and mountain climbing skills, we are inspired by her courage and adventurousness; but not enough to even think about trying it. Travel Tip #5 – Hike the Lookout Mountain trails the first chance you get. As best as I can tell, fifty-three years since the I Have a Dream speech, there is more freedom ringing out for Americans of color from Lookout and Stone Mountain than there once was. As a Caucasian, born with opportunities many have not had, with good fortune beyond my dreams, I know that we still have a good ways to go for America to be a great nation with equal opportunity and justice for all. To let freedom ring, we must heed that Injustice anywhere is a threat to justice everywhere. Martin Luther King, Jr.
After days of rain in the forecast, the rain gods finally have their way. Tuesday le deluge comes to western North Carolina. After John Denver hiking (i.e., that’s right – sunshine on our shoulders) near Hot Springs, we have rain and more rain on this our zero day (no hiking). Stepping in and out of drenching downpours, we hit Asheville hot spots: Lunch at O’Charley’s with Hannah’s sister Bettsy, then later dinner at Chorizo (Mexican) with Jeff, my College of Wooster tennis teammate. No matter the weather, there is no doubt we are going to hike in Tennessee this mid-October Wednesday. Only 45 minutes from the AT in Tennessee, we won’t miss this chance as tomorrow we head for home some 1000 miles away. Waking in the Mars Hill, NC Comfort Inn, we can’t even see across the parking lot. The fog is Great Smoky Mountain thick. After a motel breakfast that includes biscuits and gravy for Hannah, we drive west on I-26 to Erwin, Tennessee, a mere 45 miles away, through fog, then into sunlight. The AT passes through Erwin a mere 340 miles from the AT’s origin at Springer Mountain, Georgia. The hiking gods have smiled upon us as we will be hiking precipitation-free today. Driving along the Nolichucky River, we are winding our way deeper into the rural South. Visions of Deliverance come to mind. Deliverance (1972) scared the bejesus out of me. All the worst stereotypes of hillbilly mountain folk are shown in terrifying detail. It’s a disturbing movie along the lines of Fargo (1996) in that it’s all too real and frightening. Even so, we are fearless today. Passing the Nolichucky Hostel and Outfitters on River Road, we park roadside. After yesterday’s heavy rains, the Nolichucky is at flood stage. Crossing the bridge, we see another of the many small churches in town. Erwin has 6000 people. YP.com lists 254 churches in Erwin! You do the math. Once home to Cherokee Indians, Erwin earned some notoriety in 1916 by holding a public execution of an elephant. Who knew? Mary, the elephant, had killed her handler, Walter Eldridge, in nearby Kingsport. Crossing a railroad, we climb mountainside above the Nolichucky River on this 50F degree morning. With the heavy wind and rains of the past 24 hours, the trail is leaf covered; our goal is to hike four miles to the Curley Map Gap Shelter. Starting at 1700 feet here in the valley, we will climb 1400 feet more. Along the mountainside through a thick forest above the river, we have the beauty of lush rhododendrons each step of the way. The trail is foot-pleasing dirt with enough rocks to keep our attention. We are walking in a forest treasureland far beyond the routines and “to-dos” of daily life. Again, we are blessed. Once done with the steady climb, we return to our ridge line conversation. Is it a red flag to feel sorry for another? On the surface, feeling sorry for another might make it seem like one cares. Not so fast my friend. Could something else be going on? Say a little self-righteous judgment? When we feel sorry for another, are we really saying that “we have decided that you have not made the right choice or, more likely, the choice we would have made?” Projecting that their life is something less because it is not the life we would choose seems a tad arrogant. Well, a ton arrogant. Let me show you the Curley Maple Gap Shelter. Heading back down the mountain, we soon meet Loaf who is section hiking the AT. (A section hiker is one planning to hike the entire AT, but in sections of say, two weeks here, four weeks there, over the course of a number of years). He did find a shelter last night from the rain, but said Monday’s 50 mph winds on Big Bald (a mountain top without trees) were the toughest. Funny 50 miles south of Big Bald that same day, we were hiking in the 70F degree sunshine of the AT near Hot Springs. His trail name Loaf was given to him years ago, when starting off on the AT at Springer Mountain, he carried a loaf of French bread for days for a fellow female hiker. Back at the Nolichucky, we pack up a little after noon, set to take a 20 mile detour to see Damascus, VA, just over the Tennessee border. Nestled in the Blue Ridge Mountains of Virginia, Damascus is known as the #1 “Trail Town” along the A.T. It holds Trail Days, a multi-day festival attracting thousands of hikers during mid-May each year (Mid-May is about the time that many thru-hikers who began hiking the AT at Springer Mountain, Georgia arrive in southern Virginia). With Tennessee in the books as our 13th of 14 states of the AT, we set our sights on #14 Georgia next fall. What an opportunity we have to combine it with some hiking in the Great Smoky Mountains National Park.